Peptide sequence around aa.1279~1283 derived from Human VEGFR-3. Goyal S,et al. (2010) Arch Ophthalmol.128(7):819-24. Smith NR,et al. (2010 )Clin Cancer Res.16(14):3548-61. 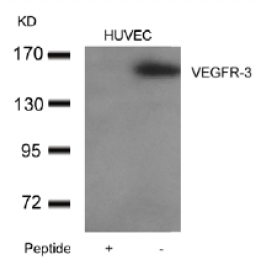 This antibody detects endogenous level of total VEGFR-3 protein.